Description: Baddow House was built in 1883 by Edgar Thomas Aldridge, the "Founding Father" of Maryborough. Christened "Aldridge's Castle" by some locals, it was "Aldridge's Folly" to others: a grand, two-storey home overlooking the Mary River, with huge rooms, soaring ceilings, an abundance of cedar joinery and panelling, six fireplaces and wide verandas upstairs and down. In 1848, when E. T. Aldridge first arrived in the district of Wide Bay (as Maryborough was then known) he built a bark and shingle hut on his land at Baddow. But success as an entrepreneur soon allowed him to upgrade his home, and finally, thirty-five years after his arrival, to build his dream home, his "castle": the magnificent Baddow House as it stands today. Baddow House remained in Aldridge hands until 1912 when it was purchased by Mr Hugh Biddles, who had made his fortune as a pearler off the coast of Broome. The Biddles lived at Baddow until the start of WWII, after which the house entered a long period of misuse and neglect. During the 1960s the house was re-born, and was used as a reception centre for parties and functions. Many people in Maryborough today have memories of weddings and celebrations enjoyed at Baddow House. The current owners bought Baddow House in 2003 and undertook a complete restoration and renovation of the property, returning to the house its air of opulence and grandeur. 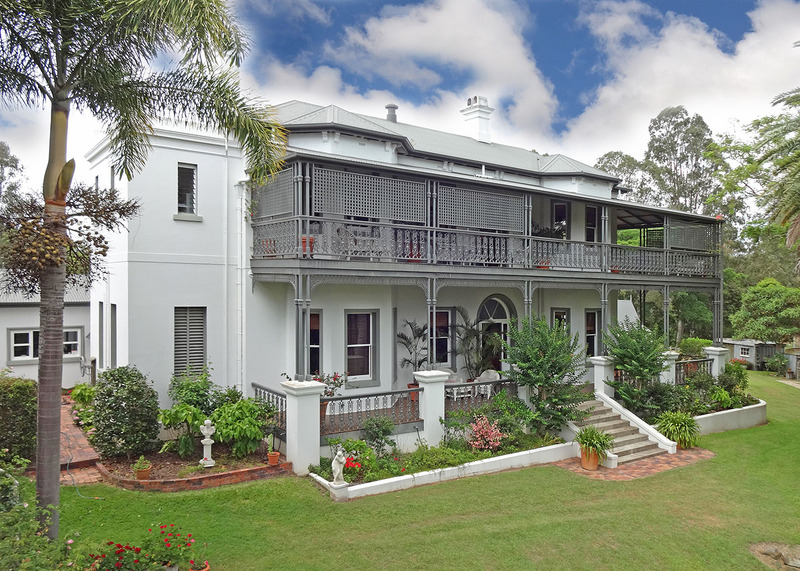 Baddow House is a two-storey Victorian villa, totalling 896 square metres under roof, built in the Georgian style with the addition of verandas upstairs and down as a concession to the Queensland climate. The exterior and interior walls are triple brick, rendered. Floors are Crows Ash and Hoop Pine, and all of the joinery (including doors, panelling, architraves, skirting boards and the original staircase) is Red Cedar. There are six fireplaces (three upstairs, three downstairs), internal archways, stained glass, and six large bay windows, as well as many other original features. Accommodation includes six bedrooms, three bathrooms, two sitting rooms, huge dining room, library, office, large country kitchen, scullery, wide entrance hall and sunny upstairs landing. The entire house is completely restored in a style sympathetic to the period in which it was built, allowing for modern conveniences, such as air-conditioning in key rooms, and the two-bay garage with remote controlled door and secure internal access to the house. A separate studio (28 square metres) stands in the garden, with power and plumbing connections, ideal for conversion to a guest cottage. The two acres of garden are beautifully landscaped, and feature brick paving, two arbours, a canal pond, and extensive plantings of shade trees including Jacaranda and Poinciana. Joy Fox on 0438 463 480. Contact Sprake Real Estate - Maryborough Today!!! Email Sprake Real Estate - Maryborough Now!